Lions, design apartment in the heart of Cordoba. Located in the historic World Heritage in a charming building, among the monuments, the Mezquita and the commercial center of entertainment and restaurants of the city. Designed for the comfort of visitors, beds with viscoelastic mattress, fully equipped kitchen, bathroom with hydromassage column. Cable TV and free WiFi. Our welcome and checkin by Jose Agustin was personal and helpful. This property is elegant and exceptionally clean. The owner is generous in supplying toiletries and kitchen staples, making for a comfortable stay. The location is excellent. We were within walking distance of all attractions, and less than ten minutes to the Alcazar. Although close to the main tourist area, the apartment is quiet and peaceful. The kitchen is adequate for simple meals, but we found it better to visit the many restaurants close by for main meals. I would recommend the apartment to anyone looking for a quiet, comfortable and central apartment in beautiful Cordoba. Thank you, Jose Agustin. The perfect apartment in the perfect location! We stayed in Los Leones apartment for four weeks and our experience couldn’t have been better. The apartment is steps away from everything we would want to see, and since we were there for a whole month we saw everything! The apartment was very clean and well appointed and we can’t wait to go back again. Great apartment in an ideal location. It is an easy walk from the parking garage. The courtyard inside the building is quite lovely, as is Cordoba. The sofa was comfortable and the apartment had plenty of room. The only negative is the young school girls who clog steps at the front of the building, smoking. In spite of that we loved our time here and would choose this apartment again if we return to Cordoba. 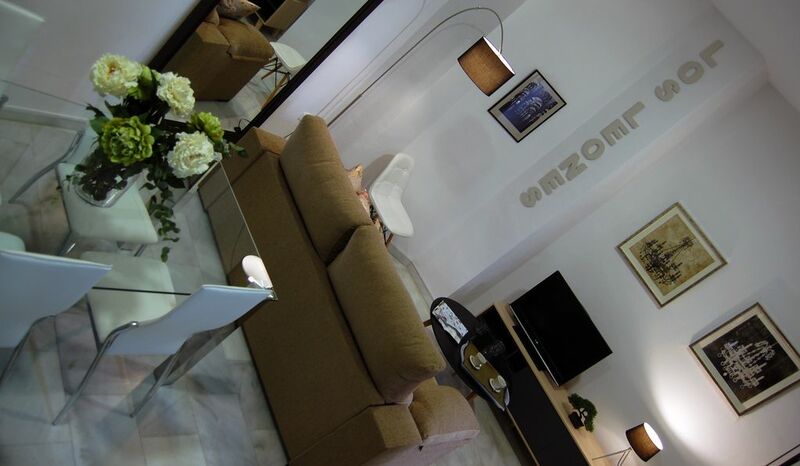 Beautiful apartment, felt like a luxury boutique hotel, an oasis in Córdoba. The owner gifted us water, chocolate and wine upon our arrival. Amazing bathroom/shower---cascading water! It was perfect for the 5 of us (2 adults and 3 kids ages 4, 9, and 16). Within easy walking distance to the mesquita a must see! Also walking to the cool food market and park. We only wish we could have stayed longer! The property is located in the old town a short walk to the cathedral and all the sights. The flat looks good but is not very practical in use, in particular the bathroom with no shelf or soap dish in the shower cubicle and when you shower the water goes all over the floor. Also a lack of shelving around the sink area. The tap in the basin runs mostly cold, to get hot water you need to turn it so high that the basin then fills up and overflows. The kitchen is adequately equipped and some basic supplies are provided. One thing that was definitely missing was a pair of kitchen scissors! Also, in my opinion, there is an excessive use of air fresheners throughout the house. Sweet hostess and perfectly appointed with great detail. We arrived an hour early to the apartment and our hostess was so sweet to meet us at the door, package of fresh muffins in hand for me and my two young children. I absolute adored the apartment. Furniture and lighting was enough to feel warm and lived-in but not too much to seem cluttered. The apartment seems completely new and renovated with not a scuff mark on the clean, white walls in sight. All my guide books said to peek in and see the patios of those in Córdoba... well we got to experience it first hand with two shared courtyard patios and a perfect private patio with the apartment that was accessible out of the main bedroom. Most important on my list was the nespresso coffee machine that was stocked and with little sugar and saccharine packets. The windows were covered with the original wood shutters and tasteful artwork of Córdoba on the walls. Can't say enough about this sweet little apartment.